The Upward Facing Dog or Urdhva Mukha Svanasana is classified as a backbend in yoga, effective for bolstering the arms, shoulders, and wrists. Additionally, the posture creates a greater range of motion in the back and neck. The Urdhva Mukha Svanasana and its variations are included in a sequence which is aimed at correcting and aligning the spine as well as in the invigoration of the nervous system. 1. Lie relaxed and face-down on the mat. Stretch your legs to the back, with the tops of your heels facing the ceiling and the upper surface of the feet on the mat. Spread out your palms and down your hands folded at the elbows, on the floor, by the sides of your waist. Your uppers are now positioned perpendicularly to the floor. 2. Take a deep breath in and push your inner hands strongly into the floor. Enjoy the interplay of force through your arms against the floor and then lift your torso off, forming a concave curve with your back and keeping it synchronized with an inhalation. Along the lower body, squeeze in your abdomen to the back. Keep your thighs straightened but a little turned to the inside. Keep your hands comfortably straightened and rested by the sides with the elbows turned up. 3. Force down the tailbone into the pubis and the pubis turned up towards the navel. Squeeze the hips, keep firm but don’t stiffen up the buttocks. 4. Expand and firm up the shoulder blades and inhale deeply, enlarging the peripheral ribs, pushing them forward. Hike up through the upper side of the sternum but don’t ram the front ribs further because this affects the lower back, hardening it up. Fix your gaze to the front and toss the head slightly to the back. Be cautious not to harden up your throat in the process. 5. Unless you are performing this posture as part of a sequence like the Surya Namaskar (of which it is a part) hold the posture for 15-30 seconds. Breathe normally without suction or force. Release from the posture by relaxing your back and coming down hugging the floor, or, lift with an exhalation assuming the Adho Mukha Svanasana. A Good Spinal Activation to Snap Out of an ‘Office Slump’- The pose makes you form a great, extensive ‘U’ with the sloping up of your back. This movement pulls at the torpid muscle strands of the spine and lower back with a regulated force. In our regular sedentary lifestyle, a lot of constrictions can grow along the spine and across the shoulder blades and chest. This restricts us from full, diaphragmatic breathing, a complete range of motion, and a mental slump from exhaustion. The gentle spinal elongation, wrist, and forearms activation, and upward neck turn, accompanied by a strong breathing can easily recharge such sagging spirits. Especially after a deskbound day of slogging at the work-station, flexing in the curves of the Urdhva Mukha Svanasana can feel as soothing as spa! Chest Opening and Fuller Breathing- Exhaustion and lack of spirits also set in due to falling oxygen levels inside the body. Long and arduous sedentary hours not only makes the back rigid but also constricts the chest width. Constricted breathing accounts for reduced oxygenation and more toxin accumulation inside the body. Organs receiving lesser oxygen cannot function to their full capacity and add to the gloom. It is also common to feel fatigued in such constricted breathing circumstances. The upward facing curve of your torso with the head tossed a little to the back in the Urdhva Mukha Svanasana will open your chest and maximize your breathing benefits. The Wrists Feel Good- The wrists and forearms allow development of biceps-triceps, chest, deltoid, and fortitude in the back. Systematic exercise for the wrists and forearms is often neglected but in the upward facing dog, it is much integral. There is weight-bearing and strengthening exercise in a place with a direct impact on the wrists in this particular yoga posture. It is advisable to follow a rotating wrist exercise before starting the practice of Urdhva Mukha Svanasana for the joints to feel well-oiled and agile. Strengthens Up Shoulders and Spine- A good 15-30 seconds in this asana keeps you engaged in a strengthening shoulder and spinal stretch as you curve up your torso and tip your head to the back. This is a great way to tone and flex the tendons along your shoulder and gain oodles of strength. Place Blocks Beneath Each Hand- Getting off the floor on the support of the wrists and forearms can be a big deal for some people. If you do not feel your wrist and forearms to be strong enough to lift off directly from the floor, use the provision of having two blocks under each of your hands. Lifting off from the elevated planes of the blocks will now be more practical. Root Down Your Feet and Lift the Thighs a Little Off the Floor– This is among the most common Urdhva Mukha Svanasana variations which help to go deeper into the pose. Maximizing weight bearing on the forearms and wrists, pull your lower belly into the backbone, lift your hips, float your thighs and kneecaps slightly above the floor, and keep your feet pointed and parallel to each other. The arches of the feet are now spread and rooted into the floor. Blanket Under the Top Thighs– The lift-off will definitely have more leverage by having a folded blanket underneath the thighs for cushioning. Practicing the posture could be degenerative in the clinical condition of—carpal tunnel syndrome. It is also best to avoid Urdhva Mukha Svanasana from the third trimester of pregnancy and in the recovery period of back injury. A headache is not a good sign and calls for stopping the practice if it occurs. 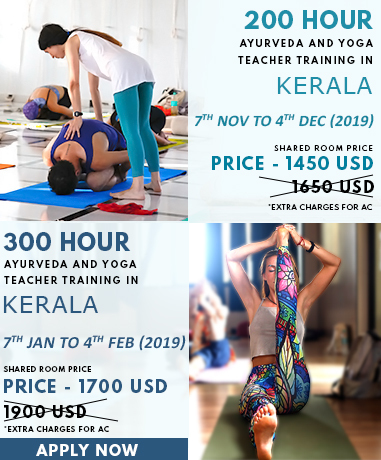 To know more about Upward Facing Dog in further detail, explore our Yoga Teacher Training In India.